The Row counter helps keep track of the number of rows knitted by turning the numbered cap. The row counter which is compatible to the needle size is slipped on to the knitting needle. The corporate headquarters and manufacturing facilities of Needle Industries (India) Private Limited are located in the Nilgiri Mountain, in southern India, 2200 meters above sea level. The Company was incorporated in 1949 as a subsidiary of a major British manufacturer of hand sewing needles, knitting pins and hard haberdashery products. Manufacturing commenced with the very simple gramophone needle. In the 1960s and 70s the ownership of the Company was then slowly transferred into Indian hands and with this change in ownership came the introduction of the Company’s own brand PONY. Over a period of time with internally sourced funds, the product range was expanded; Hand Sewing Needles, Knitting Pins and Accessories, Snap Fasteners, Hooks & Eyes and a complete range of pins were all introduced and now constitute the bulk of manufacture. 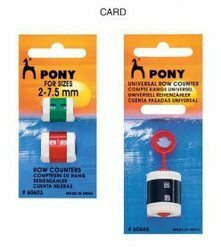 Pony branded products are now sold in all the continents of the world with exports accounting for some 70% of the Company’s total turnover.